Formaldehyde Analysis Cartridge | OndaVia, Inc. 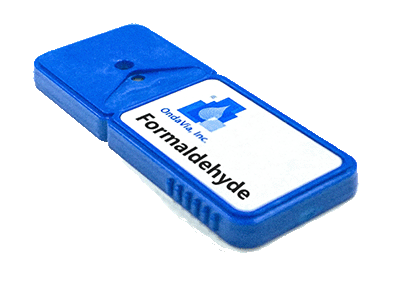 The OndaVia Formaldehyde Analysis Cartridge is designed to measure formaldehyde in aqueous solutions. The simplest aldehyde, formaldehyde is a naturally occurring organic compound that is an important precursour to many other materials. Also known as methanal, the common name comes from its similarity and relation to formic acid. It is mainly used in the production of industrial resins, e.g., for particle board and coatings; it is one of two main components for MEA- or MMA-triazine production. Formaldehyde poses a significant danger to human health given its widespread use and volatility. The US National Toxicology Program has labeled formaldehyde as "known to be a human carcinogen." These test kits are designed for analysis in acidic or neutral solutions. For analysis in basic / alkaline samples, contact OndaVia for more information.